My 1966 MGB has been in the family since new. Dad bought it new in '66 and drove it until 1975 when my brother was born. The need to transport 2 childen stopped the B from being used and that's how it stayed until late 2011 when I took it on. 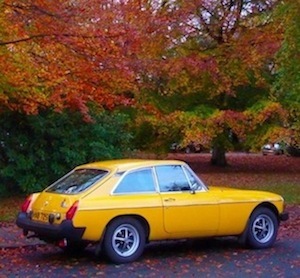 Getting it back on the road was entrusted to a local MG specialist, and by April 2012 it was back on the road. Hey Carl, good looking B. Just been catching up on your blog - have you managed to get your brake fluid leak sorted ok? Yes thanks - I ended up getting the car taken to a garage. There they started taking the Master Cylinder out and found that the clutch Master was leaking as well - so both got changed at the same time. Means it's back on the road so that's good, and much quicker than if I'd done it. Now need some nice weather, not like tonights!